Data: Can you please help me in identifying the fossil in the following pictures. It appears to contain two fossil pearls. Location: The exact location is unknown. I bought the fossil in a street market in Bogotá, Colombia, South America. I can only suppose that the fossil was gathered some place in Columbia. (kaki) that one observes in the pictures below. 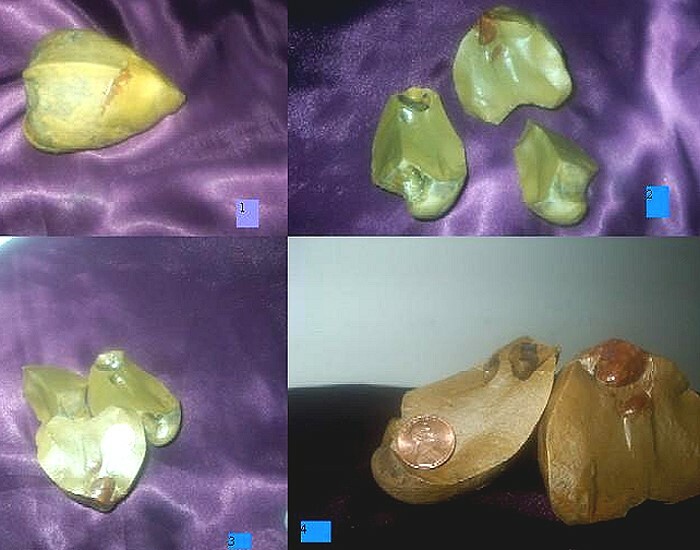 Size: The penny in the picture will give you some idea of the dimensions. Although their form is irregular the long one is a maximum is of ten (10) centimeters; height in the highest part: 6 centimeters. The biggest pearl has form of rounded cone of height 1.8 centimeters; wide in the base (diameter) of 1.3 centimeters; volume, that is to say how much it stands out of the surface where it is: 1 centimeter. I cannot determine to what depth it is inserted that is to say how much there is under the surface, because I fear to damage it and if it extracted it it would lose their originality. The small pearl is fairly oval a centimeter long and about 4 millimeters in the widest part; it stands out approximately of the surface 2,5 millimeters; I don't know to how much depth it is inserted, it could hardly be stuck to the surface. polishing machine, it gives an intense red coloration. I find that what fossilized was the whole mollusk - the fleshy animal - and that the shell disappeared. In the later fossil, it has two prominences that as I have been able to discover lately - I am not specialist and up to now it had not been interested - they would correspond with the form of the family glossidae. 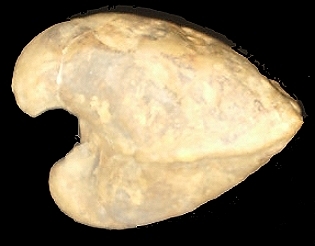 The large fossil is an internal mold of a large bivalve. Although some Glossidae are similar, as he mentions, a large arcoid such as Cucullaea would also be a likely possibility. The "pearls" look like external molds of small bivalves, preserved inside the large one. It is not the flesh that has been fossilized, as that rotted away shortly after the animal died. Instead, the shell cavity was filled with mineral deposits afterwards, then the shell disappeared, so what you have is an internal mold. As to the "pearls", it is difficult to tell what they are, as the pictures are not sharp enough. Some other fossilized shells, some mineral concretion? The large fossil is definitely a bivalve, not a brachiopod... I work with both! 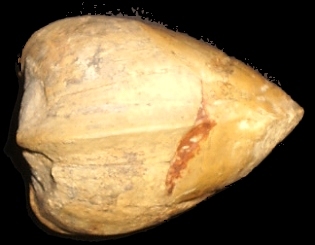 The shell was infilled with sediment or minerals and then hardened; after this the aragonitic shell dissolved away, leaving a 3-dimensional negative of the shell. 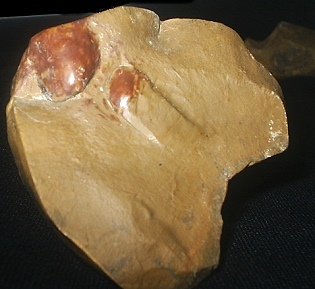 The umbos (beaks) are too incurved and wide-spaced for any brachiopod but a spiriferoid, and lack the slits that would be present (these slits being the molds of the internal buttresses in brachs); clearly visible are the impressions of the thickly-callussed adductor muscle scars. These indeed indicate a member of the family Cucullaeidae, probably genus Latiarca. Ths large size is well with this diagnosis. 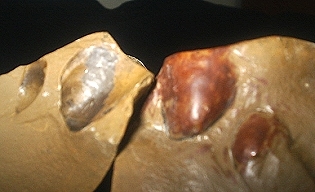 The brown shells within are members of the subclass Pterioida, which differ from most molluscan shells in that they are calcitic in composition, and often remain intact when aragonitic forms are dissolved. 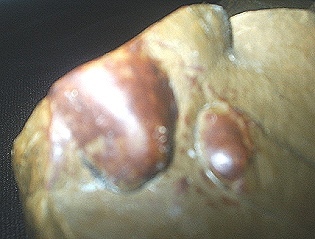 They are strongly asymmetric (oblique, the umbos can be seen to be at the anterior end). It is possible that they retain at least a hint of their original perly luster, though I can't see this in the images. Age is probably Cenozoic, though cucullaeids close to Latiarca existed in the Cretaceous.